by providing voice-over, subtitling, translation, transcription and audio description services in over 80 languages. Delivering excellence for over 30 years, from our production studios based in Reading, UK. We offer a vast range of quality voice talent in over 80 languages. Our free casting service will help you find the right voice, at a price you can afford. 3 Pro-Tools recording studios in-house, deliver a reliable service and rapid response. With over 25 years’ industry experience you can trust us to know what were doing. Our stress free service and technical expertise, means you just send your video, and we’ll return it with translated subtitles and captions within days. With three recording studios and two video editing suites, you’d be forgiven for thinking we’re just a regular post-production business. What makes us different is our focus on producing multi-lingual content in over 80 languages. We offer a specialist transcription service, converting spoken word and on-screen captions into text. We also add timecode cues, so the translator understands the video ‘space’ available for the new voice-over or subtitles. 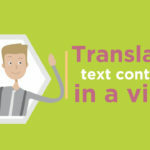 Unlike most translation agencies, we specialise in translation of video content for voice-over and subtitles. With over 30 years’ experience, you can rest assured your project is in safe hands and handled as carefully as you would want. Audio Description makes your video more accessible for blind or partially sighted viewers. It’s becoming increasingly important, as new EU regulation enables disabled views to access on-line content. Matinée make sound, make sense. It’s simple. We offer impeccable service quality, coupled with over 30 years’ experience in the industry. That means we’ve seen it all, dealt with it all and our expert team at Matinée are here to make your project exceed expectations and at a price you can afford. The speed of response, and friendly, efficient service from all staff was quite exceptional. Matinee particularly stands out by putting the customer’s needs first, even when the job is relatively small and a bit of a technical challenge. I would strongly recommend Matinee for any subtitling work. A fantastic company to work with. Fast email responses, rapid delivery of audio files, and all with positive and warm personalities shining through! Thank you Matinée for a wonderful customer experience. Very pleased with a number of projects completed by Matinée. They are always well organised, providing clear expectations, organisation, efficiency and always deliver a quality product on time. Recommended. I have to mention the quick response of Sally and Nicole to my last minute request. They both understood the urgency of my need, and helped me complete the recording to hit my deadline. Very helpful and pretty quick at completing projects. I always receive a rapid response to my queries. I’m looking forward to working with you again on the next one. I think the different stages through production were really good; finding the voice-overs I was looking for, the project management, the help I needed to solve a last minute problem, and the sound engineer’s contribution during the recording session. I use Matinee for a lot of subtitling projects and they never fail to meet the deadlines. Great customer service and fast responses. Well done to the entire team.